Your wedding ceremony and vows reflect the uniqueness of your relationship. It captures the celebration of your love which has brought the two of you to this special moment in your lives. It is my desire to work with you to create a memorable wedding ceremony. I strive to incorporate the significant points in your lives as well as your love, beliefs, and values. I am an ordained and licensed minister registered to officiate weddings in the states of Virginia, Maryland, and Washington, D.C. I am a professional Officiant who is trusted to perform ceremonies with respectability and significance, whether it is traditional or progressive. 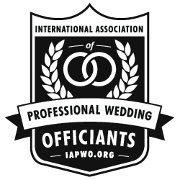 I am also a member of the International Association of Professional Wedding Officiants (IAPWO). • Officiate brief in-office ceremony. • File marriage application with the appropriate municipality. • Provide details about obtaining certified copies of your marriage record. • Officiate traditional or alternative vow ceremony. • File marriage application with appropriate municipality. • Coordinate with wedding planner, DJ, photographer, etc. • Officiate traditional, contemporary, or alternative vow ceremony. • Two ceremony consultations with bride and/or groom. • Unlimited email, telephone, or virtual communication with couple. • Incorporate Additional Elements; Unity Candle, Sand Ceremony, Washing of the Hands, Jumping of the Broom, etc. • Prepare and provide Order of Ceremony and Rehearsal Guides. The Basic and Premium packages are priced within a sixty (60) mile radius from the 20006 zip code. Please feel free to contact me if you are interested in securing my services. I will ask you a few questions and encourage you to do the same.